Gardeners have always passed along plants—we’re a generous group who dislike tossing a perfectly good plant onto the compost heap if we can provide it with a good home. We pass along divided plants, extra seeds, and cuttings. These plants have morphed into “passalong” plants, a tradition that is particularly strong in the South partially due to our long growing season and partially due to historical reasons. Pioneer women would take along seeds and cuttings from their prized plants in an effort to bring familiarity to the frontier. The Tombstone rose arrived in Arizona this way: a young Scottish bride brought a white Lady Banks rose with her and planted what was to become the largest rose in the world. The Tombstone rose now covers a distance of 9000 feet, supported by an extensive trellis. The Civil War was instrumental in accelerating the practice of passalong plants when the North imposed a blockade on Southern ports. Southerners had to make do with what they already had so passalong plants became more important than ever before. Passalong plants were particularly important in isolated parts of the country. Today in Texas, “rose rustlers” are on the lookout for unnamed roses whose ancestry, if ever known, is all but forgotten. The rose rustlers are intent not only upon preventing these unknown varieties from dying out but also introducing them to the public. Because theirs is a large state, many Texans had to depend upon the passalong tradition as a method of acquiring new plants simply because there were no local nurseries to supply these needs. Because they are relatively easy to propagate from cuttings or to grow from the seeds produced by their rose hips, roses were popular passalong plants. One of the most famous in the 21st century is the rose ‘Peggy Martin’. The rosarian, Peggy Martin, acquired an unknown rose from her hairdresser and subsequently planted it. When she returned to her garden two weeks after Hurricane Katrina, there were only two plants that were still alive in the toxic stew: one was the unnamed rose and the other was a crinum. Peggy Martin designated the rose as a symbol to all those who had survived the storm, naming her ‘Peggy Martin’ or the Katrina rose. What plants make good passalong plants? Generally, it is those plants that are easy to propagate. The infinitely dividable daylily is a great passalong plant—it’s easy to divide, easy to plant, and hard to kill. The wonderful old Southern crinum is an excellent passalong plant. Although it’s crabby if moved, the crinum produces offshoots that are easy to detach and plant. Plant the crinum where it will never be moved and you will be able to passalong its babies. Those plants that produce underground stems we call rhizomes are easy to passalong—simply snip off a piece of the rhizome and part of the above ground stem and you’ll soon have a new plant. Many annuals produce collectable seeds. The opium poppy, Papaver somniferum and Cleome produce many seeds that remain viable in the soil over the winter. By producing so many seeds they will return year after year. Just be aware that poppies dislike mulch and Cleome has little thorns, making it a bit difficult to discard should you want to. As with everything, there is a downside to some passalong plants. Some are invasive. When I was new to gardening, a friend gave me some rather sweet small yellow irises. It turned out they were the yellow flag iris, Iris pseudacorus that can take over an area. Another undesirable is the enchanting Northern sea oats, Chasmanthium latifolium. The seed heads are delightful until the seeds sprout, producing deep-rooted plants impossible to pull out. Rosa multiflora is an obnoxious weed that produces between 500,000 to one million seeds per annum—and that’s just from one shrub. This is a rose you do not want. It’s important to know the plant before you acquire it. I wouldn’t take the trumpet vine, Campsis radicans, despite the fact that hummingbirds love its flowers. 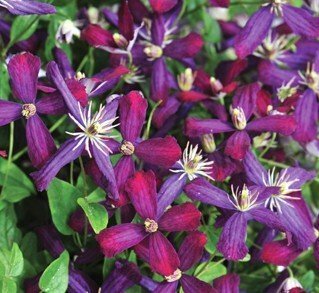 I would also decline a gift of the native Clematis virginiana. Both these vines are overly vigorous in my mind. However, I’d jump at our hardy begonia, Begonia grandis. Yes, this begonia will seed and will spread but it gently fills in bare spots in the garden and minds its own business. I would treasure it. There are many wonderful passalong plants. Just be aware that there are some plants you really do not want so it’s important to do a little homework first.